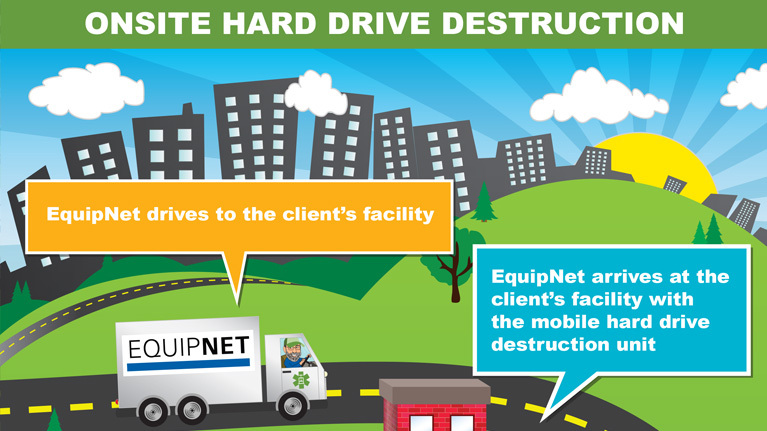 The process of destroying and recycling hard drives with EquipNet asset management services. 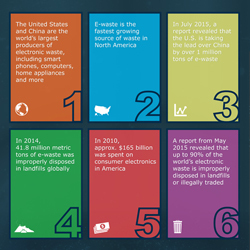 Electronic waste affects everyone across the globe – Be sure to comply with proper environmental recycling regulations. 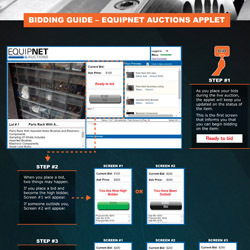 The bidding guide for EquipNet Auctions Applet. 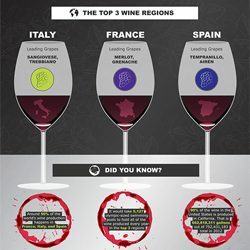 An inside look at the global wine industry broken down by consumers and manufacturers. 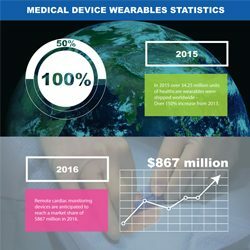 Wearable devices are in high demand and are experiencing vast growth, especially in the medical device industry. Plastic is one of the most common materials used around the world. 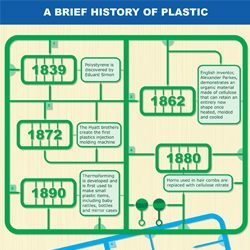 Get an inside look at some of the history behind plastic. 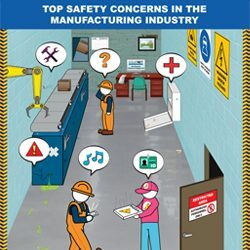 Working in manufacturing plants and other industrial facilities can pose many safety concerns. Some of these concerns include maintenance issues, permanent hazards from large equipment, general carelessness and much more. 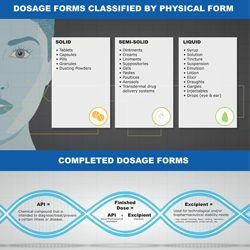 Pharmaceutical medications are available in a number of different dosage forms and are classified in various ways. Get an inside look at the pharmaceutical dosage industry. 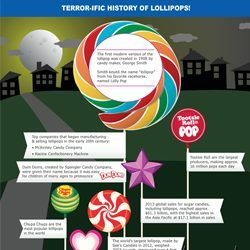 Ever wonder where the term Lollipop came from? We’ve got the inside information for this sweet sector of the confectionery industry. 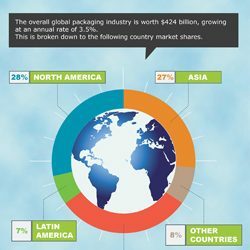 The overall packaging industry is worth over $400 billion – See which countries hold the largest market shares. 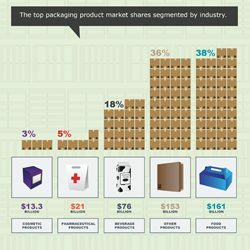 Many materials are shipped all over the world within the packaging industry. Here are some of the top materials. 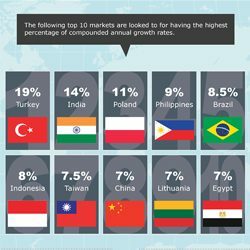 Did you know the top fastest growing market for the packaging industry is Turkey? Take a look at the others here. 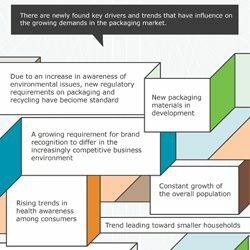 There are many key drivers and trends influencing the packaging industry – Check some of them out here. 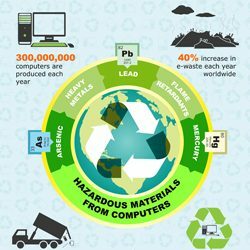 Don’t add to the digital dump; over 300,000 computers are produced each year and only 40% are properly recycled. Recycling 100 million smart phones can save enough energy to power up 20,000 homes per year – Be sure to dispose of your cellphones and other electronics properly. 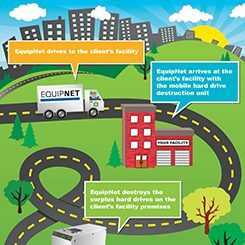 EquipNet Computer Equipment Value Recovery offers a range of services to manage your IT equipment, including buying and selling surplus, asset remarketing, data security and much more. 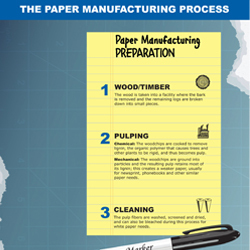 The step-by-step basics of how paper is created, including the preparation and the processing. Did you know that researchers estimate that 8 trillion plastic microbeads are released into our waterways each day in the US alone? 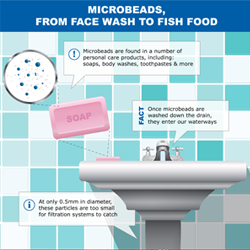 Take a look at this infographic outlining the lifecycle of plastic microbeads. 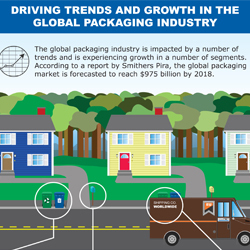 The global packaging industry is impacted by a number of trends and is experiencing growth in a number of segments. 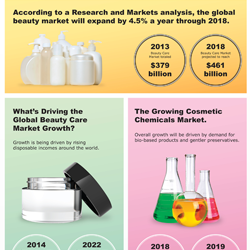 According to a report, the industry is expected to reach $975 billion by 2018. 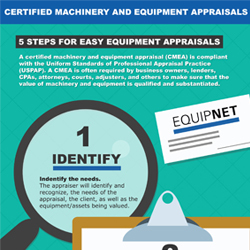 A Certified Machinery and Equipment Appraisal (CMEA) is often required by business owners, lenders, CPAs, and many others to make sure the value of their machinery and equipment is qualified and substantiated. Here is the process of a CMEA. 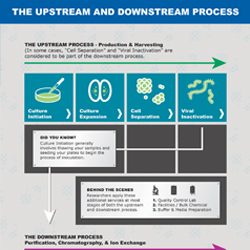 Check out this infographic for an outline of upstream and downstream processing. The upstream process includes production and harvesting, and the downstream process consists of purification, chromatography, and ion exchange. 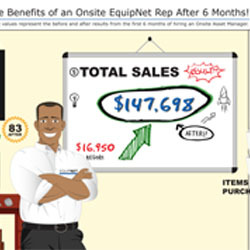 These values represent the before and after results from the first 6 months of hiring an EquipNet Onsite Asset Manager. With the assistance of an onsite manager, you have the capability to benefit from over $100,000 in redeployment savings and more. 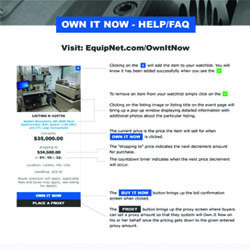 Need help navigating our new purchasing channel, Own It Now? 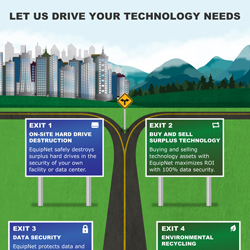 This infographic outlines the basics for all you need to know about purchasing through Own It Now. 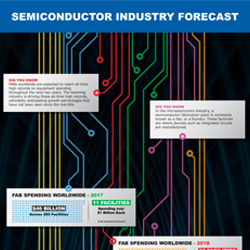 The semiconductor manufacturing equipment industry is forecasted to grow 13.2% from 2016 to 2017, driven by facility equipment needs and semiconductor manufacturing specific to memory and power needs. EquipNet SmartAuctions™ use colored indicators to show the status of a lot. 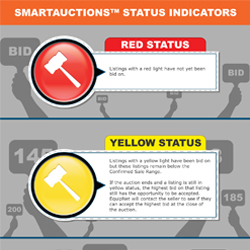 Our SmartAuction™ status indicators automatically update you on the changing status of your bid. Take a look at this infographic for more information on our status indicators. EquipNet SmartAuctions™ use colored indicators to show the status of a lot. 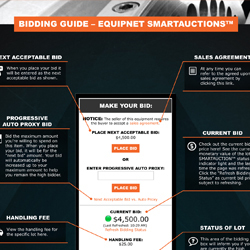 Use this bidding guide for all you need to know about bidding in EquipNet SmartAuctions™. The EquipNet SmartAuctions™ platform utilizes popcorn bidding with bids entered within 5 minutes of the close of the auction. 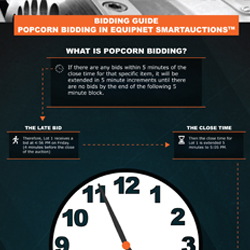 Check out this infographic for all you need to know about popcorn bidding with EquipNet SmartAuctions™. 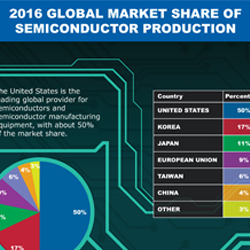 The United States is the leading global provider of semiconductors and semiconductor manufacturing equipment, with about 50% of the market share. 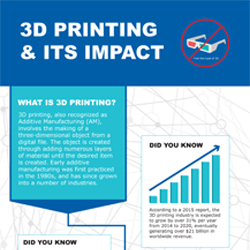 3D Printing, also recognized as Additive Manufacturing (AM), involves the making of a three-dimensional object from a digital file. 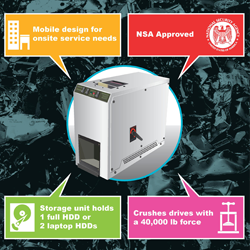 Check out the overview of the process and more on this infographic. 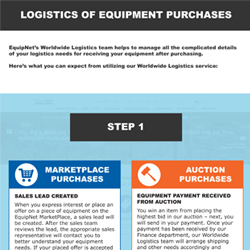 EquipNet’s Worldwide Logistics team helps to manage all of the complicated details of your logistics needs for receiving your equipment once purchased. Take a look at the basics of the process below, including MarketPlace sales and Auction items. 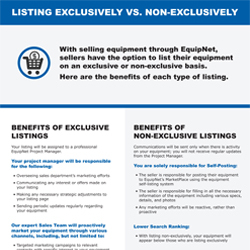 With selling equipment, we offer sellers the option to list their assets on an exclusive or non-exclusive basis. Here are the benefits of each type of listing. FABs worldwide are expected to reach all-time high records on equipment spending in the upcoming years. 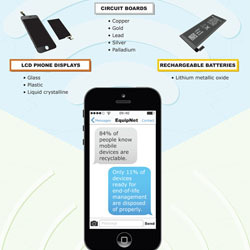 Check out our semiconductor industry infographic for more details. The global pharma industry is one of the largest in the world, with total revenues reaching over $1 trillion worldwide. 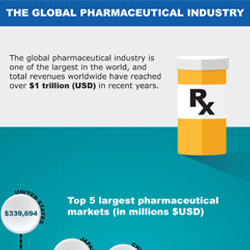 Learn more about the global pharmaceutical industry in our infographic. 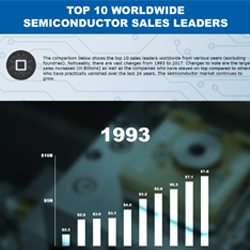 The comparison below shows the top 10 semiconductor sales leaders worldwide from various years (excluding foundries). Changes to note are the large sales increases (in Billions) as well as the companies who have stayed on top compared to others. 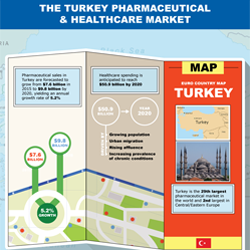 Turkey is the 29th largest pharmaceutical market in the world and the 2nd largest in Central/Eastern Europe – Pharmaceutical sales in Turkey are forecasted to grow from $7.6 billion in 2015 to $9.8 billion by 2020. 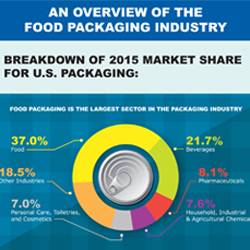 Some of the most innovative segments in the food packaging industry include snack foods, meat/related products, fruits & veggies, and pet food. 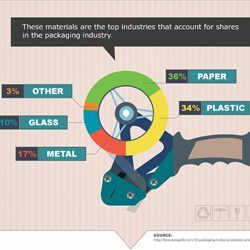 These segments are being driven by a number of trends, including biodegradable packaging and more. 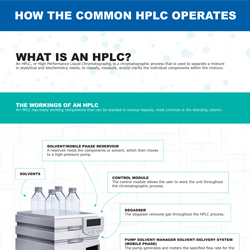 An HPLC is a chromatographic process that is used to separate a mixture in analytical and biochemistry needs – Learn more about how the common HPLC operates in our infographic.